»Why Choose Theatre As A Major? Theatre degree programs at Chapman are comprehensive and rigorous. The Bachelor of Arts represents a general and well-rounded curriculum that is often a perfect choice for those wishing to combine theatre with another degree program. Those completing this degree program may find careers performing, casting, or teaching in schools, colleges, studios, adult education programs, children’s programs, community programs, companies and resorts. 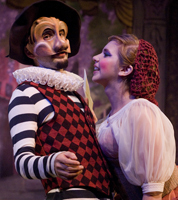 The Bachelor of Fine Arts is designed for those seeking professional performing careers in theatre. Entrance to the BFA Program is by audition only and is highly selective. Students desiring admission to the BFA programs must achieve a high level of competency by excelling in coursework and department productions. Students graduating from Chapman University with degrees in Theatre are prepared to enter the exciting field of arts and entertainment in a spectrum of job opportunities. Recent graduates in the Department of Theatre at Chapman have found employment within theatre companies, television, film, Broadway touring companies, teaching, theatre production, behind-the-scenes stage crews, media productions, directing, and theatrical production. Theatre is a wonderful career for individuals who enjoy artistic collaboration in tandem with hard work, creative output and physical achievement.